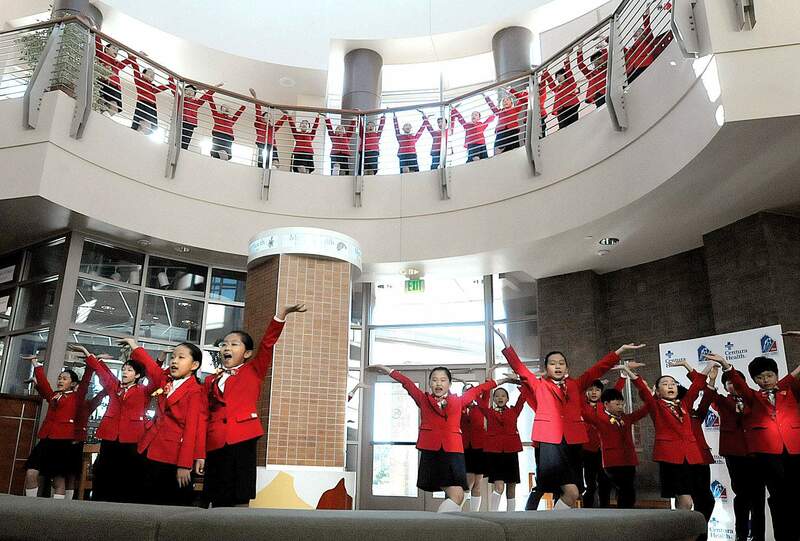 The Korean Children’s Choir performs Saturday morning at Mercy Regional Medical Center. They came with evangelist and broadcaster Billy Kim, who befriended local Durangoan Gen. Ron Fogleman and his wife, Jane, in the early 1990s at Osan Air Base in South Korea. They encouraged him to come to Durango with the choir. 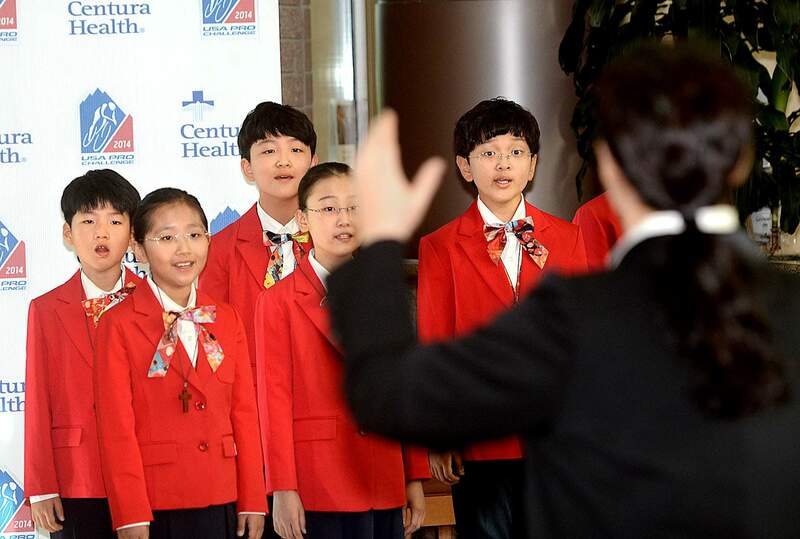 The Korean Children’s Choir performs Saturday morning at Mercy Regional Medical Center. “We just want to say thank you to America for what they have done for Korea,” says the Rev. Billy Kim. The choir is associated with Kim’s broadcasting company. 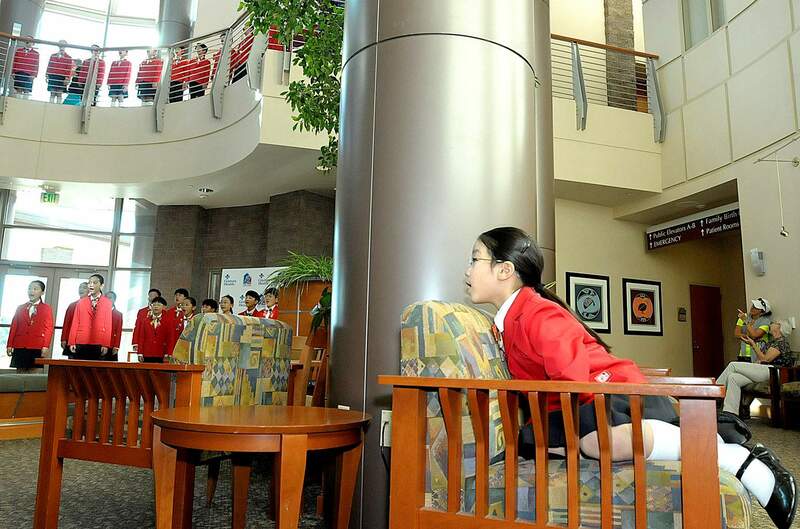 Yeong Chae Lee, 10, sings along with the Korean Children’s Choir on Saturday morning at Mercy Regional Medical Center. A friendship between retired Gen. Ron Fogleman and the Rev. Billy Kim was key in bringing the children’s choir to Durango. A group of Korean children all dressed in matching orange are singing “Chattanooga Choo Choo,” in English, with choreography, as the sun sinks on a rural Durango ranch, the La Plata Mountains in the backdrop. They are here with Billy Kim, an 80-year-old South Korean evangelist and broadcaster well-known not only in his country, but globally. He’s well acquainted with the current UN secretary general, Ban Ki-moon, and has hobnobbed with a who’s who of world dignitaries, as diverse as Cuba’s Fidel Castro and the Rev. Billy Graham. The occasion is a small, private barbecue at the home of Gen. Ron and Miss Jane Fogleman, who moved to Durango 17 years ago after the general’s military career took him to points around the world and concluded with him as Air Force chief of staff. It all seems a bit surreal, this busload of extremely polite, smiling Korean children who mostly don’t speak English being brought to Durango for a barbecue and a couple of public performances. (Oh, one of Billy Graham’s daughters, Gigi, is here, too.) But if you start breaking down the chain of events that brought us to this point, it will make some sense. Let’s focus on the remarkable story of Billy Kim. He was a 16-year-old high school student when the civil war reached his hometown of Suwon, just south of Seoul, in 1950. His school was bombed, and shortly after that, a U.S. Army camp moved into his neighborhood. The young Kim, having no school to attend, visited the camp to see what goods he could scrounge. Soon, Kim explains as the Foglemans announce dessert, he was bringing wood to the soldiers to trade for rations. One soldier asked him to tend the stove, and Kim took the liberty of wiping off and shining the soldiers’ muddy boots and cleaning up dirty mess kits. “They liked my work, so they asked me to come every morning,” he says. When North Korean forces overran Seoul and much of South Korea, the U.S. soldiers bolted south. His new GI buddies took Kim with them. At the new camp, Kim was introduced to Sgt. Carl Powers, who put him to work as a houseboy. Powers appreciated Kim’s work and one day offered him the chance of a lifetime: A trip to America and a U.S. education. Kim thought the sergeant was just being courteous but signed his name on a school application that Powers filled out. But Powers convinced him to go, then went to Kim’s home and convinced his reluctant mother, too. He arrived in San Francisco with $130 and, because he was so small, got a cross-country plane fare for the younger-than-12 rate of $78. Sgt. Powers paid his tuition to Bob Jones Academy in Greenville, South Carolina, and Kim began an eight-year education that concluded with him receiving a master’s. But those first few weeks in America nearly broke him. Kim says he accepted Christ, and his homesickness vanished. And ultimately, his plan to become a politician was replaced by another calling. He returned to Korea in 1959, teaching his new American bride his language on the 17-day boat trip. 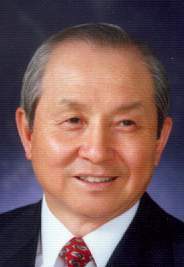 When he began his work at Suwon Central Baptist Church that year, it had about 12 members. Billy Kim proved to be popular. With the strength of his Far East Broadcasting Co., the church is now up to about 15,000 members. OK, fast forward to the early 1990s, and the Foglemans are in Korea, where the general is stationed at Osan Air Base, not far from Suwon. Every Sunday, Billy Kim would come to the Air Force chapel and give a sermon. Billy Kim and the Foglemans have been friends ever since. As key U.S. liaisons in a foreign country, making connections with counterparts, whether it’s leaders or their wives, can be crucial, the Foglemans say. “You develop the trust in one another, so when something happens, you pick up the phone and talk to somebody you know,” Miss Jane says. 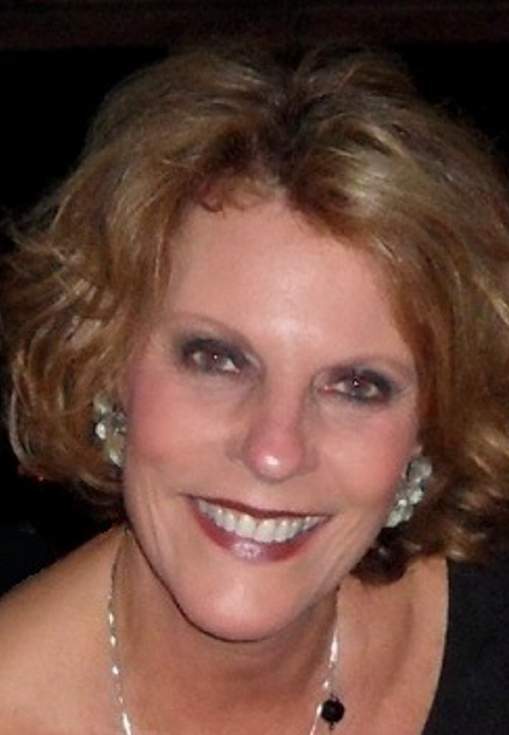 Miss Jane sits on the Mercy Health Foundation board of directors, and it was ultimately decided the Koreans’ performance Saturday night at the Fort Lewis College Community Concert Hall would be a fundraiser for the foundation. Durango sometimes seems like an insignificant little place far from the country’s movers and shakers. But don’t be deceived. Stay around long enough, and you’ll begin to see some invisible connections. Like this: The committee formed to bring the Korean children to Durango included Joy and Scott Mathis. Joy Mathis used to hang out with Gigi Graham in Florida and wondered if Graham, a speaker and author, would like to visit Durango while Kim was here. When Billy Graham spoke to an estimated 1.2 million in Korea during his 1973 “crusade,” Billy Kim was his interpreter. Gigi Graham and Billy Kim co-hosted an ecumenical sermon Sunday afternoon at the Community Concert Hall. Billy Kim has had an eventful life and hasn’t forgotten why. Although American military forces aren’t universally revered these days, South Koreans haven’t forgotten. He’s in Durango because he’s paying back the Foglemans’ and U.S. troops’ loyalty. “We just want to say thank you to America for what they have done for Korea,” Kim says. When the children, ages 7-13, finish their charming rendition of “Chattanooga Choo Choo,” we clap, and the youths bow from the waist in unison. johnp@durangoherald.com. John Peel writes a weekly human-interest column.